Ōtsuka Kinnosuke (1892-1977) was a renowned Marxist economist and a noted poet. He donated the major part of the Japanese books from his library to the Deutsche Staatsbibliothek (now reunited with Staatsbibliothek zu Berlin-PK) in East Berlin in six donations between 1962 and 1986. The last one was given posthumously by his widow. The donor was held in very high esteem by the Deutsche Staatsbibliothek, and in 1966 at the instigation of the library Ōtsuka was awarded an honorary doctorate of Humboldt University. In addition Ōtsuka played an important role in the relations between Japan and the German Democratic Republic (GDR). In 1975 his activities were rewarded with the order “Stern der Völkerfreundschaft in Gold” (“Star of Nations’ Friendship in Gold”). 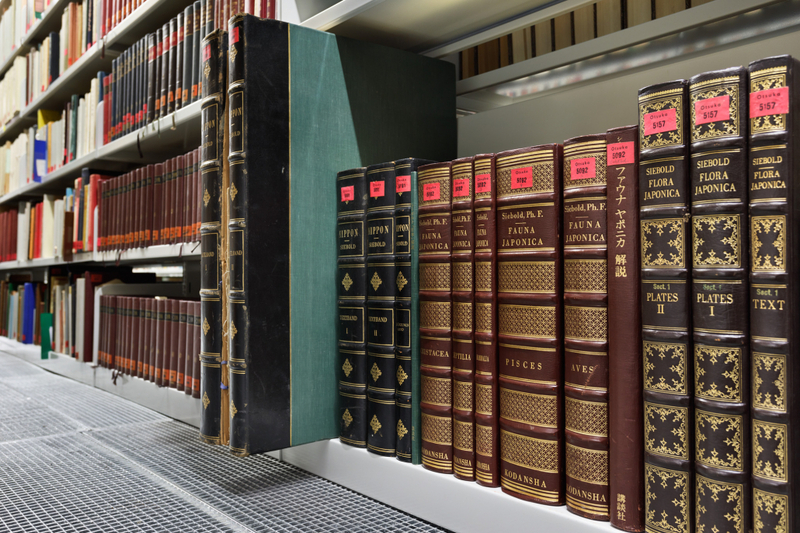 The so called “Bibliothek Otsuka“ – the Ōtsuka collection – consists of more than 4.600 book titles in Japanese, about 140 titles in Western languages and nearly 150 journal titles. 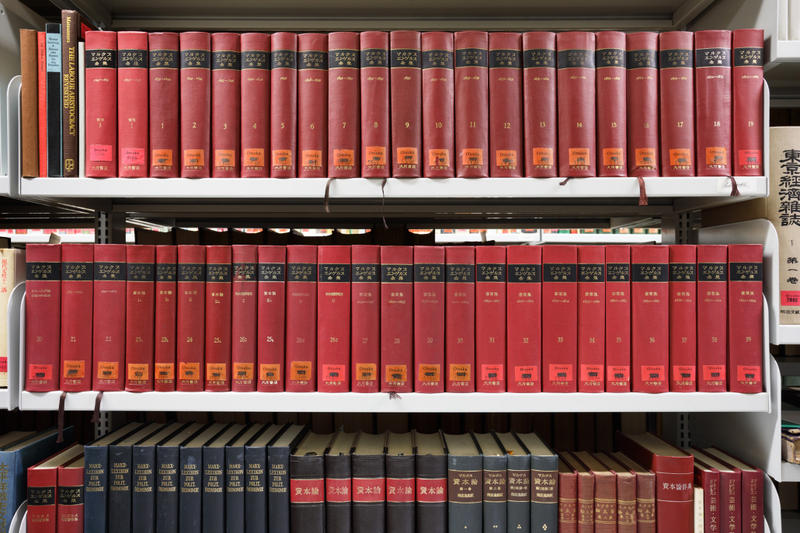 The collection is dominated by works on economics and social sciences with a special focus on Marxism, socialism, politics, women’s issues and minorities. However, as a poet Ōtsuka also included several literary works such as proletarian poetry in his donations. 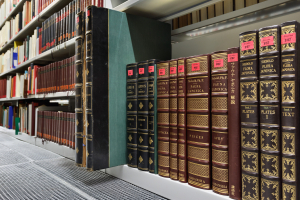 The entire collection can be searched through the online catalogues of the Staatsbibliothek zu Berlin-PK: Japanese books are included in the OPAC of the East Asia Department, books in Western languages and all journals are to be found in the StaBiKat. In both catalogues the collection is directly searchable by its shelfmark “Otsuka*”. Ōtsuka Kinnosuke (1892-1977) was a renowned Marxist economist and a noted poet who donated the major part of the Japanese books from his library to the Deutsche Staatsbibliothek in East Berlin. 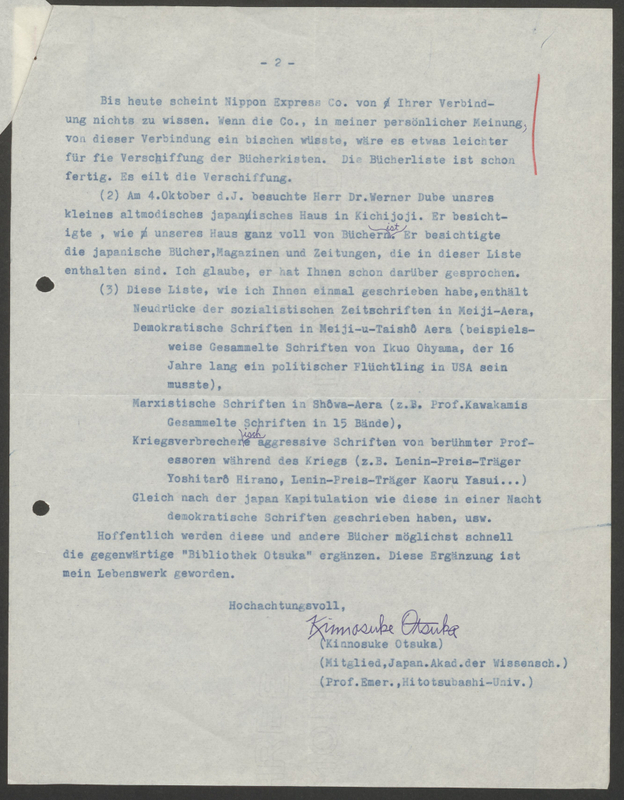 Ōtsuka who had studied at Berlin University (today Humboldt University) in the 1920s felt greatly attached to the German Democratic Republic (GDR) and considered the enlargement of the “Bibliothek Otsuka“ – the Ōtsuka collection – as it was named in Berlin, as his “mission in life” (“Lebensaufgabe”), as he wrote in a letter to the Deutsche Staatsbibliothek on 10th March 1970. The collection was built up in six donations between 1962 and 1986. The last one was given posthumously by his widow. Originally Ōtsuka had worked as a professor for economics at the then Tōkyō University of Commerce (since 1949 Hitotsubashi University). However, in the time before the Second World War he experienced great hardship, because of his activities as a committed Marxist. In 1933 he was arrested and accused of having violated the Peace Preservation Law (chian ijihō) that was aimed to control political opposition. The trial ended with the verdict of a two year prison sentence that was suspended for a probation period of three years. Ōtsuka not only lost his job at university, but was banned from all public positions. He stayed under strict surveillance of the authorities until 1945. After the war he was rehabilitated and returned to his former university. There he continued to teach and do research until 1956. In addition Ōtsuka became to play a substantial role in the relations between Japan and GDR Whereas Japan had given full diplomatic recognition to West Germany in 1955, diplomatic relations between East Germany and Japan were not established until 1973. Ōtsuka supported the activities of the Nichidoku Bunka no Kai (Japanese-German Culture Association, founded in 1954) that had the aim to foster the cultural exchange especially with the GDR. During the 1960s several Japan-GDR Friendship Associations (Nihon-DDR Yūkō Kyōkai or Nichidoku Yūkō Kyōkai) were founded in Ōsaka, Kobe, Kōchi, Fukuoka and Tōkyō. Ōtsuka was appointed as one of the official advisors (komon) for the Tōkyō Association (Nihon-DDR Yūkō Kyōkai) whose head he became in 1973. In 1960 Ōtsuka was asked to attend the celebrations for the 150th anniversary of Humboldt University. Four more stays in the GDR followed. 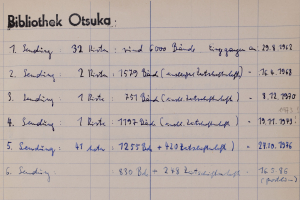 After a stay at Oxford University Ōtsuka spent a longer period in East Germany in March 1965 and also visited the Deutsche Staatsbibliothek. In 1966 he and other representatives of the Japanese-German friendship organizations were invited to take part in the “Tage der Freundschaft mit dem japanischen Volk” (“Days of Friendship with the Japanese People”) – a campaign held from 12th to 15th September 1966 in Weimar and East Berlin including an exhibition of Japanese art, a symposium and other events. One highlight of the “Friendship Days” was the ceremony of granting an honorary doctorate of Humboldt University to Ōtsuka. In 1969 he also attended the celebrations for the 50th anniversary of the Asia Africa Department of the Deutsche Staatsbibliothek in East Berlin. The aim of Ōtsuka’s last journey abroad in 1975 was again East Germany. During his stay the Liga der Völkerfreundschaft (“League of Nations’ Friendship“) which was the umbrella organization for all international friendship associations in the GDR, awarded Ōtsuka with the order “Stern der Völkerfreundschaft in Gold” (“Star of Nations’ Friendship in Gold”). His attachment to East Germany is also shown in two of his works. The seminar he taught at Meiji Gakuin University after his retirement had its own publication which was named after the famous boulevard in Berlin “Unter den Linden” (“Under the lime trees”). In 1969 Ōtsuka summarized his experiences in the GDR in a book with the affectionate title “Aru shakai kagakusha no henreki – minshu doitsu no tabi” (“The pilgrimage of a social scientist – a journey to the democratic Germany”) which is one of the first detailed publications about the GDR in Japanese. Not long after his death in 1977 his collected works were published in ten volumes (“Ōtsuka Kinnosuke chosakushū”) from 1980-1981. Several of his former students later established the Ōtsuka Society (Ōtsukakai). The Society publishes its own periodical, the “Ōtsukakai kaihō” and keeps the memory of Professor Ōtsuka Kinnosuke alive to this day. Here you can find more information about Ōtsuka’s life, work and his role in the relations between Japan and the GDR. The process how the donations found their way to our library is very well documented in the records of Staatsbibliothek zu Berlin. 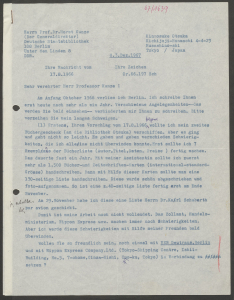 As Ōtsuka understood German, he conducted the entire correspondence with the Deutsche Staatsbibliothek in German. He also published his own recollections of the first donation in the seminar publication “Unter den Linden” in an article entitled “7th February 1962” (“1962nen 2gatsu 7nichi”, No. 4, March 1962, p. 37-39 or “Ōtsuka Kinnosuke chosakushū”, vol. 5, 1981, p. 283-287). 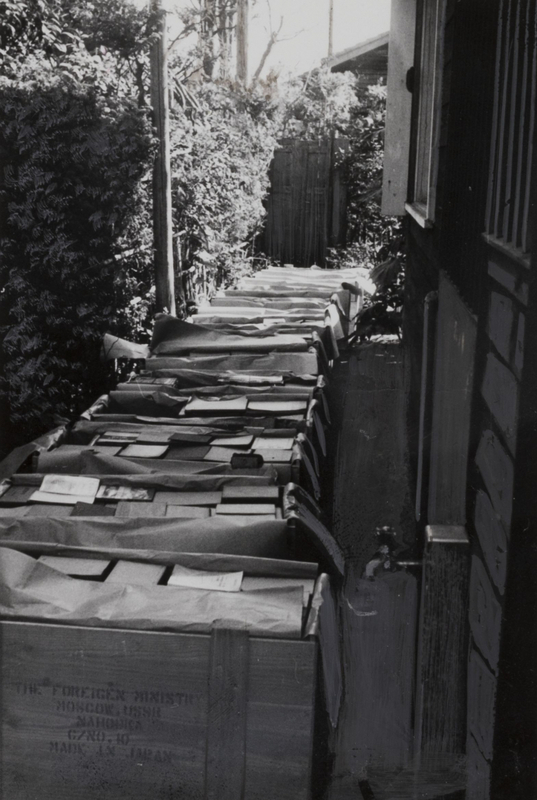 On that day the first shipment of 32 boxes with approximately 6000 volumes left his house in Tōkyō. He called it a new “starting point” in his life. However, as will be explained the actual course of events was not without obstacles. When Ōtsuka attended the celebrations of the 150th anniversary of Humboldt University in 1960 the idea to give his library as a gift occurred to him for the first time. Originally Ōtsuka had intended to donate the books to the Humboldt University Library. He had already talked to its director, Prof. Dr. Willi Göber, but Prof. Dr. Göber died suddenly in June 1961. Ōtsuka was left without his contact in East Berlin and was at a loss what to do. Attempts to approach the widow and Prof. Dr. Göber’s successor were met with no response. 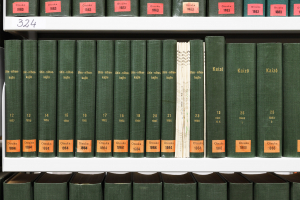 After taking council with his younger colleagues who had teaching experiences in the GDR, they recommended to give the collection to Deutsche Staatsbibliothek instead. 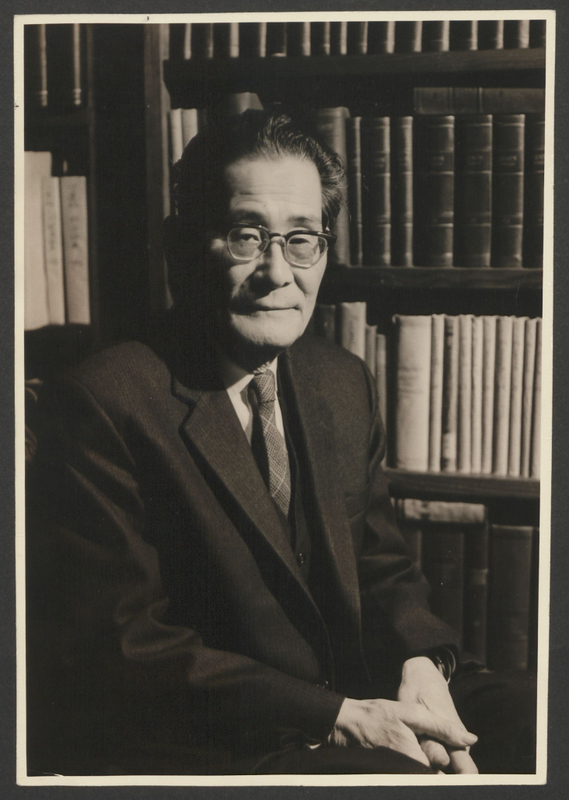 In Ōtsuka’s opinion the DSB had the greatest need among the state libraries of the world, as the original collection had suffered severe losses due to the Second World War. With the help of a colleague Ōtsuka managed to organize a transport with the assistance of the Soviet embassy in Tōkyō on the Siberian railway via Moscow. The costs were borne by Ōtsuka’s friends and the Soviet embassy. As the shipment was treated as diplomatic post no customs duties were charged. 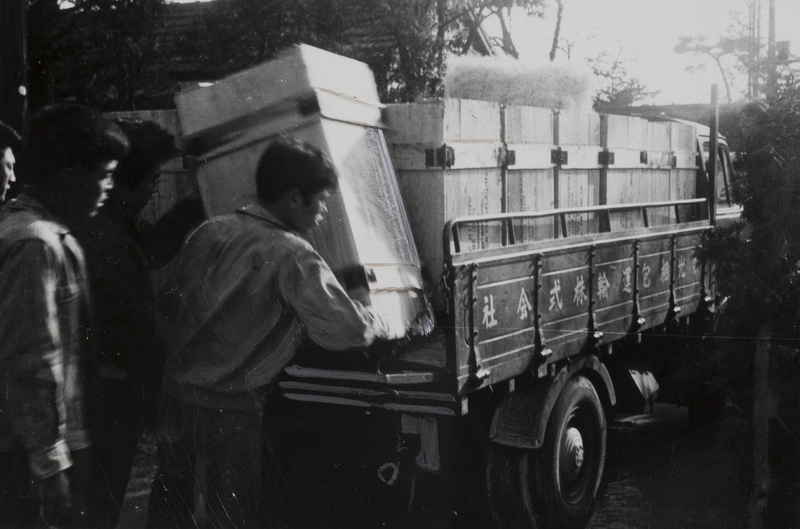 Only after the boxes had left Japan Ōtsuka wrote to the economist Carl Otto in East Berlin in order to announce his donation. 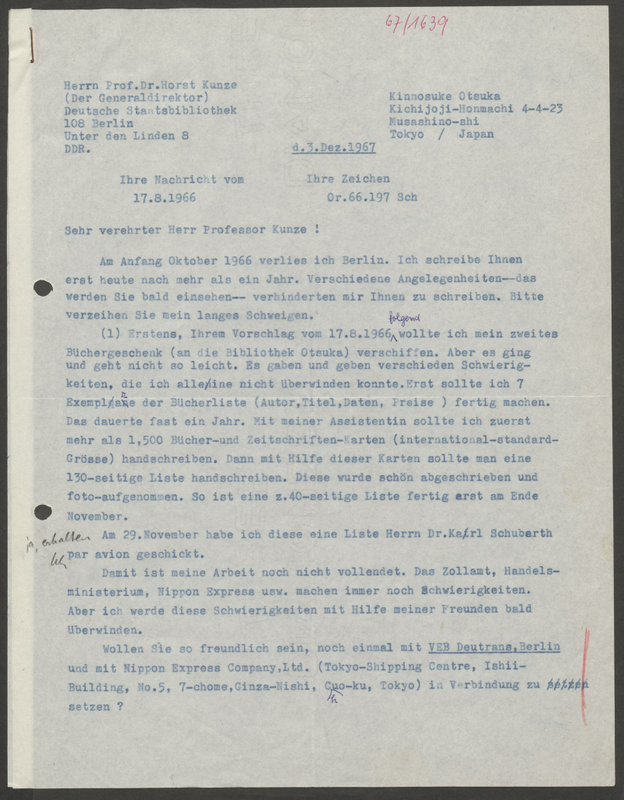 Otto then contacted the Deutsche Staatsbibliothek that books from Ōtsuka were on their way. The library was certainly surprised about this unexpected gift, but in April 1962 Prof. Dr. Horst Kunze, director general of the Deutsche Staatsbibliothek from 1950 to 1976, wrote a letter of gratitude to Ōtsuka and thanked him for his “great sacrifice”. The term „Bibliothek Otsuka“ was chosen as name for the new collection. In the end the first transport from Japan to the GDR turned out to be a complicated process full of bureaucratic pitfalls. 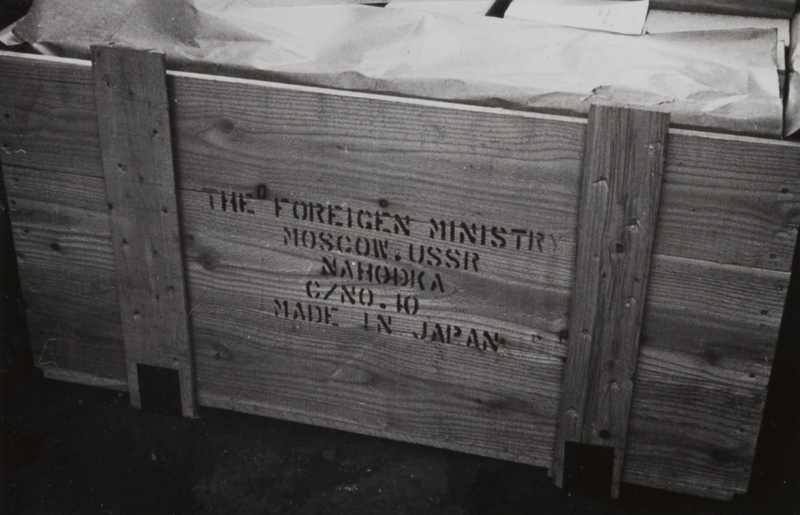 It was not easy to get the 32 boxes from Moscow first to Frankfurt/Oder and then to East Berlin. Various official bodies on the GDR and Russian side were involved. For some time it was unclear where the shipment exactly was. Many letters and notes were exchanged between the involved parties. In the end the Deutsche Staatsbibliothek had to make substantial payments for the complete transport from Japan to the GDR in Russian roubles and East German mark. The head of the Oriental Department (from 1966 Africa Asia Department), Dr. Karl Schubarth, had to explain to his superiors why these costs had been necessary. Nevertheless, the Deutsche Staatsbibliothek was delighted about the donation and in several magazines articles were published to make this important event know to the public. Already one year later Ōtsuka expressed his intention to enlarge the collection by a second donation. However, several years passed until this plan became real. From autumn 1964 until spring 1965 Ōtsuka stayed at Oxford University. From there he sent several Japanese books to the Deutsche Staatsbibliothek. 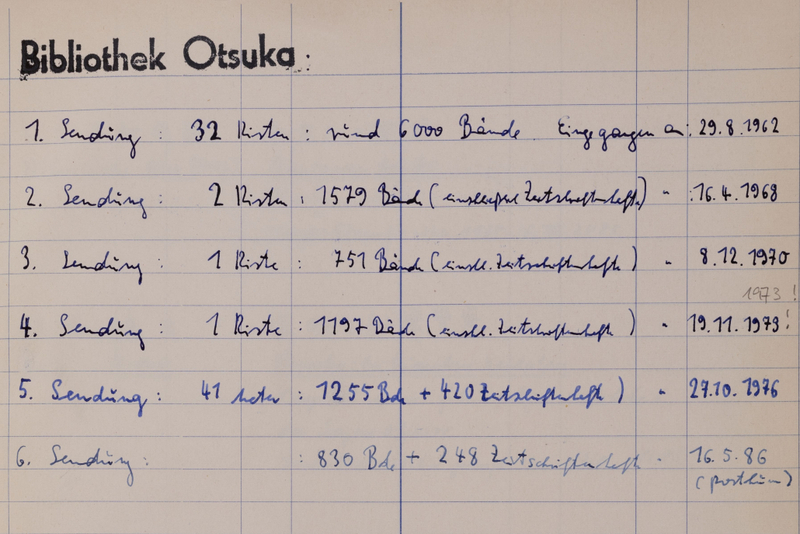 Before returning to Japan in April 1965 Ōtsuka also visited East Germany and the Deutsche Staatsbibliothek in person. The high esteem in which Ōtsuka was held by the Deutsche Staatsbibliothek can be seen in the fact that the plan evolved to award him with an honorary doctorate of Humboldt University. Prof. Dr. Kunze contacted the professor for Japanese studies, Prof. Dr. Gerhard Mehnert, who fully supported the idea. 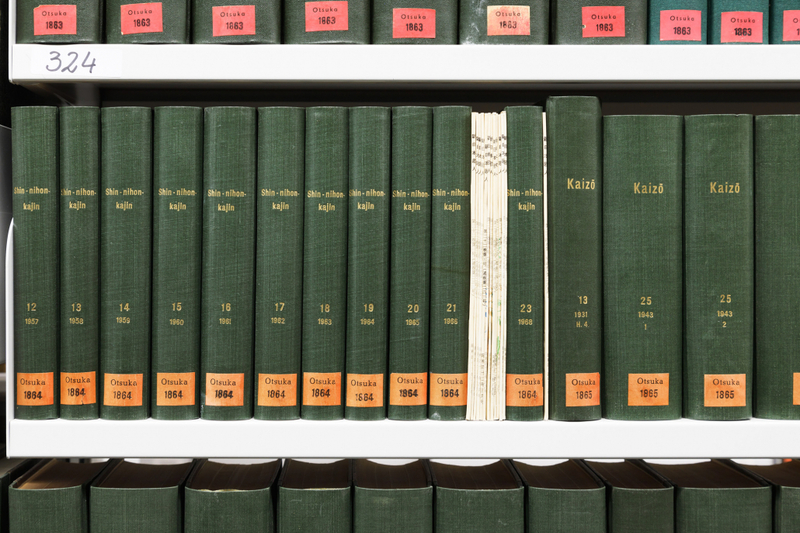 In June 1966 the application of the Deutsche Staatsbibliothek was accepted by the Faculty of Philosophy of Humboldt University. In September of the same year during Ōtsuka’s stay in East Germany, because of the “Tage der Freundschaft mit dem japanischen Volk” (“Days of Friendship with the Japanese People”), the festive ceremony took place. Some time passed until Ōtsuka announced the next donation of more than 1000 volumes to the Deutsche Staatsbibliothek in December 1967. In the age before the computer the preparations for such a shipment were very time-consuming. Long detailed lists of all titles had to be written by hand for the transport companies and customs control. In addition the communication between the Deutsche Staatsbibliothek and Ōtsuka did not completely work out as planned. 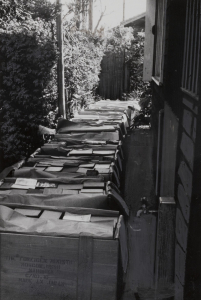 The Deutsche Staatsbibliothek had hoped to receive the two boxes via a ship to Poland, however in the end the shipment arrived in Hamburg, West Germany. 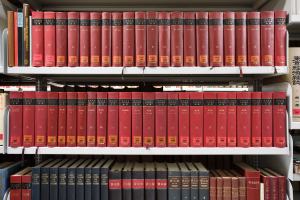 Again the Deutsche Staatsbibliothek had to pay substantial sums in foreign currency. Nevertheless the Japanese books and journals were of great value for the Japanese studies in the GDR. From the third donation onward the transports finally went smoothly as sea freight to Rostock. Ōtsuka divided his library between several institutions. The Deutsche Staatsbibliothek received the main part of his Japanese books and journals (about 12.200 volumes). In 1974 he gave his books in Western languages (about 8000 volumes) to the Hitotsubashi University Library. A large collection of about 30.000 items of other materials (clippings, manuscripts, administrative files, teaching materials etc.) is also in the possession of the same library. A third Ōtsuka collection was established in the year 2000 at Meisei University Library with about 400 volumes mainly in Japanese. 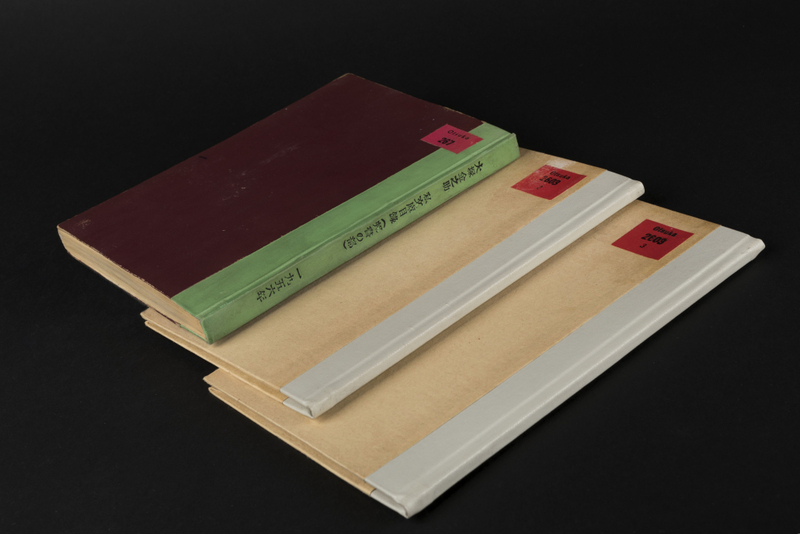 Until 1962 Ōtsuka had compiled three printed catalogues of his own collection, the “Shibunko mokuroku” covering the periods until June 1956, 1956-1959 and 1959-1962 that he also included in the donations to the Deutsche Staatsbibliothek. However, as the catalogues were lacking Latin transcription of the bibliographic information they were considered as not very helpful by the librarians. “For twelve years from 1933 to 1945 I was kept under special observation by the Office of Prosecution, Tokyo Police Court, Tokyo District Special Higher Police and a local police-station. As the war clouds hanged over the Pacific, it was no longer allowed for any one in the country to own Marxist, socialist, liberal and humanistic books of any kind whatever. Tens of thousands of people in Japan began to burn their private collections of prohibited books by their own hand. Day after day for several months I burned my own with sorrow and anger but without fuss. 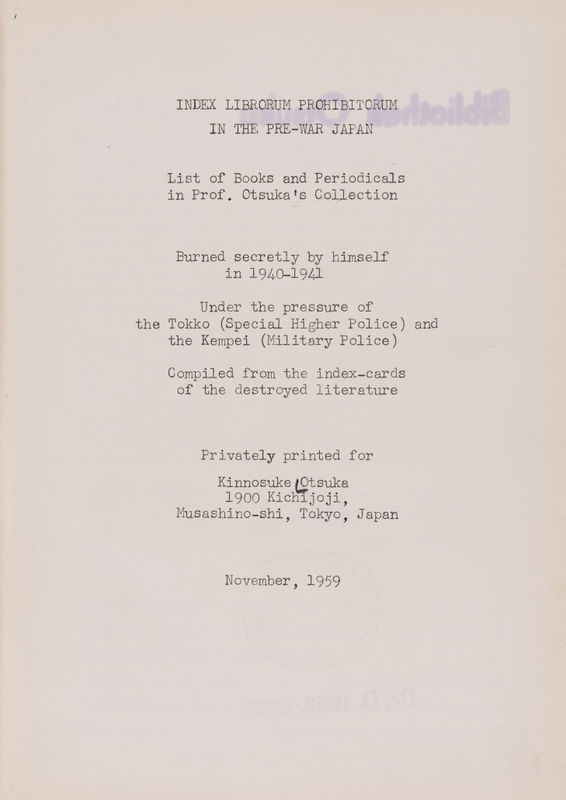 Nevertheless, Ōtsuka managed to secretly preserve the card catalogue of the destroyed titles. 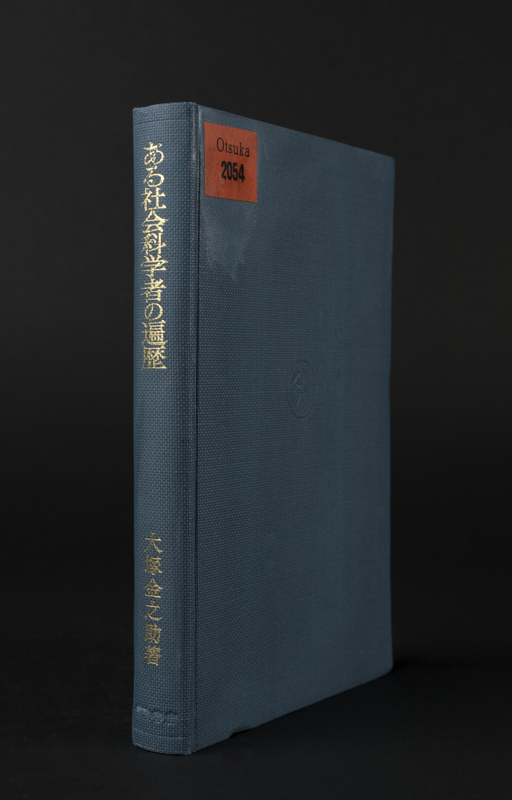 After the war he compiled together with several members of his seminar the “Index Librorum Prohibitorum in the Pre-War Japan” and during a stay in China in November 1959 Ōtsuka had it printed in 50 copies at his own expense. 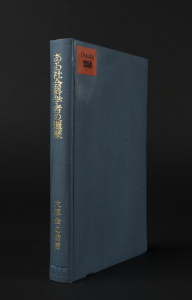 In accordance with his studies Ōtsuka’s collection mainly contains books and journals about economics, socialism and Marxism such as the collected works of Marx and Engels in Japanese (22 vol., shelf mark: Otsuka 5500) or the complete reprint of the journal “Shakai mondai kenkyū” (“Research on Social Problems”, Otsuka 2071, Otsuka 3130) written by the renowned scholar of Marxist economics, Kawakami Hajime. With regard to politics Ōtsuka also included many books in Japanese and Western languages about the atomic bombing of Hiroshima and Nagasaki. Other topics that are covered in the collection concern the situation of women in Japan or minorities such as Ainu, the indigenous people of northern Japan, and Burakumin, a discriminated community of people that was treated as outcasts, as their occupations were considered as impure, because of their relation to death (e.g. undertakers, butchers, tanners). Another subject that Ōtsuka mentions himself in his letters are reprints of historic travel descriptions written by foreigners such as Carl Peter Thunberg, Engelbert Kaempfer or Ivan Fedorovich Kruzenstern (=Adam Johann von Kruzenstern). The most prominent of these titles are the expensive reprints of the three main works by the famous explorer of Japan, Philipp Franz von Siebold, the “Flora Japonica” (2″ Otsuka 5157), the “Fauna Japonica” (2″ Otsuka 5092) and “Nippon” (2″ Otsuka 5091). Certainly the collection also reflects Ōtsuka’s work as poet. Apart from the two collections with his own poems, “Asaake” (1947) and “Jinmin” (1979), also works by famous poets such as Bashō or Ishikawa Takuboku are included. In addition titles with proletarian poems are to be found, such as the “Shakai shugi shishū” (“Collection of Socialist Poetry”, Otsuka 1043, Otsuka 2361) by Kodama Kagai or the “Kinrōsha shisenshū” (“Selected Collection of Worker’s Poems”, Otsuka 3232) published by the Shin Nihon Bungakukai (New Japan Literary Society) that was founded after the Second World War to give the proletarian literary community a new voice after the years of suppression. The journal titles of the Ōtsuka collection are completely dominated by the field of economics. However, the socialist literary magazine “Shin nihon kajin” (Otsuka 1864) and its forerunner “Jinmin no tanka” (Otsuka 1890) are also included in the collection. 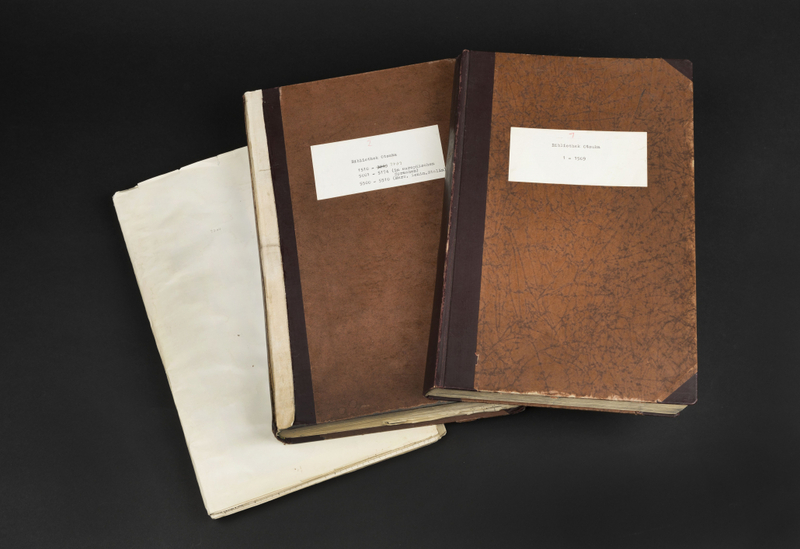 The three inventories compiled by the Deutsche Staatsbibliothek for the Ōtsuka collection are now kept by the East Asia Department.